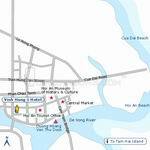 Vinh hung 1 hotel is only hotel in Hoi An in Chinese style. For those who really want to soak in Hoi An architectural flavor, stay in one of the two second story rooms in the original wooden house. Furnished with antique furniture and oriental rugs, but a bit dark and threadbare, these rooms are the real thing. Drive time from Danang International Airport to the Vinh Hung 1 Hotel is approximately 35 minutes. Extra bed adds US$ 05/night/person. Late check-out (until 18:00) is charged at rate of US$ 5 per hour. First class: rooms in the new house (second floor) with window offer Old Quarter view in 20m2. Suite: rooms with 2 big windows for Old Quarter view, one with double room and one with triple room, offer bathtub in 30m2. Special room: rooms at the front of second floor with special decoration, which give you feeling stay at a museum. View at balcony to Ancient town offer, bathtub in bathroom in 35m2. Vinh Hung Restaurant: is at the adjacent house, Lounge bar serve snack, coffee, wine. Travel center: organize and arrange package tours and other tourist services. Tourist transport team: with cars, vans and minibuses operated by experienced and professional drivers .